FAQ & General Info - KINDAH FOUNDATION, INC.
TIME: 12:00 p.m. – 4:00 p.m.
TIME: 5:30 a.m. - 6:30 a.m.
Bring a towel, change of clothes, Photo ID, and extra cash for parking, merchandise shopping, etc. Don’t forget all of your amazing energy and a great attitude! You can park anywhere there is available parking space, except in VIP, officials, media, and survivor reserve space. Only survivors with a designated park between shelter 8 & shelter 7. Parking passes will be emailed the Saturday before scheduled event. DO YOU ACCEPT CREDIT/ DEBIT CARDS FOR REGISTRATION PAYMENT ON RACE DAY? Yes, we do. We accept cash and debit/credit cards ONLY. ID is required for all credit/debit card purchase. WHERE CAN I PARK AT EARLY PACKET PICK-UP? Early pick-up parking, it is first, come first serve – it’s FREE. Florida Teal 5K Run / Fun Walk is a family-friendly race, as such, we do permit baby joggers/ strollers for this event, but we ask that you start in the back of the pack, whether you are running or walking. This is for your safety and for the safety of those around you. Please note that scooters, bikes, skateboards, and roller blades are not allowed on the race course. Again, we do not allow running with strollers for safety reasons. If you would like to WALK the race non-competitively while pushing a stroller, you may do so, but please start at the very back of the line for your safety and the safety of others. CAN I RUN WITH MY DOG? CAN I BRING MY DOG TO WATCH? Unfortunately, Vista View Park (where the race finishes) is not dog-friendly, so any spectator dogs will need to be somewhere else on the course, outside of the park. You may not run the race with your dog for this and other safety-related matters, unless of course your dog is a certified Service Dog. Service Dogs are always welcome. You can bring a leashed dog and jog/walk at the back of the line. We do not have a wheelchair division at the Florida Teal 5K Run/ Fun Walk and like bicycles, roller blades, skateboards and so on, no one may participate in a racing wheelchair. That said, if you would like to participate non-competitively or walk and push someone in a wheelchair, you are more than welcome to do so! Please start at the back of the field for safety reasons. Your registration includes a race bib, T-shirt, custom finisher medal, custom award, free bag check, refreshments, music, and a custom TEAL swag bag. WHAT IS NOT INCLUDED WITH REGISTRATION? Love, money, happiness, a BRAND NEW CAR, and basically anything you can think of other than what’s in the packet. Just remember to bring money for merchandise shopping and food during the event. Do not bring coolers, glass containers, pets, barbeques, drugs, tents or campers. There will be no tailgating or overnight camping at the event. Spectators get into the event for FREE! Spectator areas will vary at the venue, but most of our race will have spectator areas near the start and finish lines. We recommend that you arrive at least 1 hour before your start time. You will need this time to park, pick up your packet (if you have not done this already), check your bags, and get to the race start. Remember that traffic will be heavy on race day and could delay you even further, so try to carpool! WILL YOU HAVE A SWEAT/ GEAR CHECK FOR THIS EVENT? Lost and found will be at our survivor & information tent. All items must be reclaimed by the owner and a driver’s license will be copied for each item. Yes, the parking fee is $1.50/person. We highly recommend you carpool with your team. Be sure to bring extra cash for parking, food, beer, and merchandise from local unique vendors at the event. IS THIS A TIME RACE? Yes, this is a 5K chip-timed race, and untimed FUN walk for people of all fitness levels. We will have clocks at the start and finish. WHERE CAN I FIND MY PHOTOS AFTER THE EVENT? We will post information on pictures on our website www.kindahfoundation.org as well as our social media pages. The photographers usually have photos processed within one week of the race. Search through those photos to find your smiling face! WHERE DO I SEND MY SELFIES? Florida Teal 5K Run/ Fun Walk requires that you wear your bib centered on your stomach, upright so race officials can see your information. Use the 4 safety pins provided to pin the 4 corners of the bib to your shirt/costume. Participants without a race bib will be removed from the course for security and safety reasons. Please remember to fill out the Emergency Medical Information at check-in or online registration. If you already register online you can log back into your dashboard and update emergency contact information. CAN I RUN/WALK WITH HEADPHONES? Runner safety has always been and will continue to be, the top priority for our event. For this reason, the use of personal music devices during the running of the Florida Teal 5K Run/ Fun Walk is strongly discouraged. That said, people run with headphones all the time, and no one is going to physically stop you from doing so at the Florida Teal 5K Run/ Fun Walk. If you do decide to run with headphones, please keep the volume low so you can hear what is going on around you. Be smart and be safe. CAN I AUTHORIZE ANOTHER PERSON TO PICK UP MY RACE PACKET? A friend can pick-up your race bib and packet BUT ONLY if that person has your photo id or a copy of it and you advise us before. All race proceeds go to fund Kindah Foundation programs. This year in 2018, we asking for your support to help cancer survivors who are struggling with medical insurance, food, transportation, co-payment. All sponsorship support, runners/walkers, and friends of the race are making this possible, so thank you! Awards will be given to the top overall male and female finishers, and top three male and female finishers in each age group. WHAT IS NOT ALLOWED ON THE RACE COURSE? No grumpy people, no frowns. No bad dogs, and no unregistered runners or walkers. Can I “coach” someone and run some or all of the race without registering? Participating in a race without registering is called “banditing” the race. This is not allowed, not only for financial reasons (the Florida Teal 5K Run/ Fun Walk is a fundraiser, after all) but also for safety reasons. Imagine if only 200 people registered for a race and another 2000 people ran it bandit – there wouldn’t be enough water and medical support available for everyone. If a bandit runner is injured (to the point of losing consciousness) on the course, without wearing a race number, it is more difficult to identify him and get him medical attention. So in a nutshell, please don’t run in the Florida Teal 5K Run/ Fun Walk without registering. Now, regarding the coaching question, we understand that a coach may want to run with someone without the coach’s time being recorded. Ideally, both the coach and student will register for the race. EVERY person participating in the race needs to be wearing a Florida Teal 5K Run/ Fun Walk bib for identification purposes. Sorry, but all registrations are non-refundable, as explained the terms and conditions you agreed to when you registered. This is standard for all races, sporting events, concerts, etc. Please remember that this is a FUNDRAISER to benefit the volunteer-operated, not-for-profit Kindah Foundation. We are sorry that you will not be able to participate in the race for whatever reason but hope you understand that your donation is still very much appreciated. Prior to September 17, all registration transfer requests will be honored. During the first week of September, we will process them on a case by case basis. Once bib numbers and timing chips (D-Tags) have been assigned and race packets have been stuffed (approximately one week before the race), no more registration transfers will be allowed. Thank you for understanding. I AM INJURED, PREGNANT, HAVE A FAMILY EMERGENCY OR UNEXPECTEDLY OUT OF TOWN, CAN I GET A REFUND? No refunds. If you can’t run, you can still walk! If you can’t walk or come, then know that part of your registration fee will help support the cause. So feel good about money well spent. If you haven’t received your e-mail confirmation please email bparris@kindahfoundation.org before September 20th. All race proceeds go to Kindah Foundation in need. All sponsorship support, runners/walkers, and friends of the race are making this possible, so thank you! Is there a virtual race option? After receiving this question literally hundreds of times over the past few months, YES, we are now offering a virtual race option. If you are unable to attend the Florida teal 5K Run/ Fun Walk in person, you can still support the cause by registering for our Florida teal 5K Run/ Fun Walk virtual race and completing your 5k whenever and wherever you want! 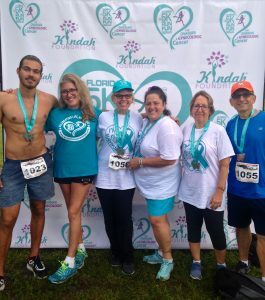 CAN I BUY A FLORIDA TEAL 5K RUN/ FUN WALK SHIRT? We get this question a lot. If there are any shirts left over after the race, we will sell them at Survivor & Information Tent for $25 each. To guarantee that you get a shirt, register for our virtual race. CAN I BUY A FINISHER MEDAL? Optional Finisher Medals are only available to those who register and pre-order them while supplies last. All virtual race participants will also receive a custom Florida Teal 5KRun / Fun Walk shirt and custom Finisher Medal. What if I can’t make it to the race and am unable to pick up my race packet, but I still want my T-shirt/tote/bib/finisher medal? We will hold on to unclaimed race packets at Kindah Foundation office until 10/1/2018. If you live out of town and won’t be able to pick up your race packet in person, we can mail your shirt to you if you make arrangements to cover the cost of shipping. During the week AFTER the race, call Kindah Foundation at 954-839-6561 Ext. 3443, pay the shipping charge (usually around $7) by credit card, we will send you the instruction by email, once we receive payment for shipment and we’ll email your race packet to you. WHAT IS RULE FOR T-SHIRT EXCHANGES? My t-shirt doesn’t fit. Can I exchange it for a different size? If there are still shirts available during packet pickup, you are welcome to exchange the shirt in your race packet with one of the ones remaining. If we don’t have the size you are looking for, hold on to the one that doesn’t fit, and beginning on October 1, we will allow people to exchange shirts with the ones from the race packets that were never claimed. CAN I GIVE / SELL MY NUMBER TO ANOTHER RUNNER? Contact baparris@kindhfoundation.org to make official transfers. Transfers are free until September 1st. Transfers are $10 September 2nd – September 21st. After September 21st, no transfers allowed. You may not sell, give, or transfer your bib to another runner without contacting and officially transferring through registration. Any runner who runs with another athlete’s bib (and did not sign a waiver) will be automatically disqualified.